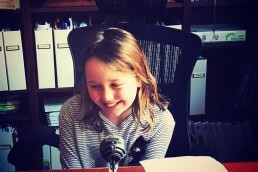 The Go Girls Podcast is a podcast for tweens where we talk to a whole lot of cool people about stuff that matters to us. In our first episode we get to talk to Turia Pitt. She was so so amazing. She had so much advice for how to live a good and resilient and happy life. After I talk to Turia, I chat to my friends Kiyara and Miya about what they thought about Turia and what she had to say. We have some other really amazing people to talk to as well. It’s all very exciting.